Halloween Hollow, a spooky entertainment event for both young people and families, has crept its way into the Chippewa Valley in hopes of becoming a standard part of our city’s annual Halloween entertainment. 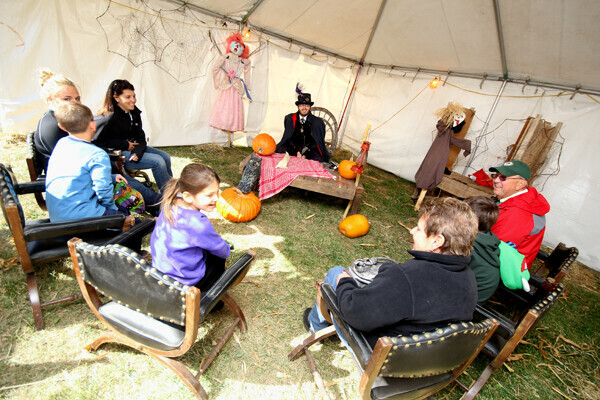 Halloween Hollow features several different attractions that promise not only a truly eerie experience for those chasing a thrill, but also plenty of daylight activities for children and families such as face painting, inflatable jungle gyms, and pumpkin patches. This venue offers more than your standard haunted houses – its array of activities attract every age group and ranges from lighthearted pumpkin patches in the day to dark, terrifying trails of terror into the moonlight. 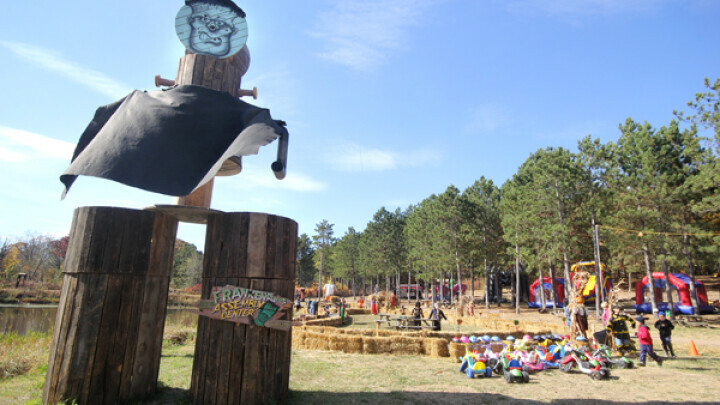 If the day time activities are more what you’re looking for, then the Enchanted Forest and/or Pumpkin Town (“Fun by Day”) are probably where you’ll find yourself; these areas are geared towards children up to ten years old and is where you’ll find the most child-friendly environment and least “scary” setting. This is also where you will find the most stuff to do for the kids such as the ones mentioned earlier as well as costumed entertainers and jelly bean bingo. Since a lot of Halloween venues aren’t always the most kid friendly, this is a refreshing setup perfect for families trying to enjoy the spooky season together. For the more courageous, daring crowd, Halloween Hollow offers entertainment into the dark with entrance into Frightmare Farm (“Fun by Night”) which includes the Corridor of the Corpse, Trail of Terror, Haunted Hills Estate and over 50 animatronics that will creep you out as much as the last Stanley Kubrick movie you watched. If you are looking for a new place to indulge in your horrifying Halloween guilty pleasure, besides the usual haunted house, this is the place to get your fix of all the zombies, vampires, terror, and gore that you crave in October. This chilling festival has many sponsors around the Chippewa Valley, some of which being Kwik Trip stores, WAXX radio, and Sacred Heart Hospital. Through its partnership with Kwik Trip, Halloween Hollow has gotten close replicas of the original cars from the TV show, The Munsters, to make appearances at different Eau Claire Kwik Trips on Wednesdays through October (except actual Halloween, ironically). The venue says of the cars, “These Monster Cars are close replicas to the original Munster Cars used in the television series “The Munsters”. The Monster Coach and Screamin’ Coffin cars were built by Randall Landwehr, and have been contracted throughout the US. They have appeared at national halloween shows and events as well as in parades, weddings and the 30th Anniversary of The Munsters in Boston in 1996.” You can find the Munster cars on Wednesday October 17th, 2012 from 4-6 PM with LIVE Radio Remote by: WIAL I-94 94.1FM at Kwik Trip (#472) 1130 W. MacArthur Eau Claire, WI and Wednesday October 24th, 2012 from 4-6 PM with a LIVE Radio Remote by WAXX 104.5FM at Kwik Trip (#633) at 2715 Golf Road in Eau Claire, WI. You can get tickets for Halloween Hollow for $19 for adults (Oct. 11th - Oct. 28th Includes Admission to Frightmare Farm), $13 for children ages 3-11 and Children 2 and under are free. You can receive discounts on tickets via coupons from your local Kwik Trip and parking is free. Adding even more to its allure and distinction from a typical haunted house is the food offered at the Scary-Oke Café and Freaky Franks Café. Both of which will serve up classic festival food like burgers, brats, chili, and caramel apples for reasonable prices. 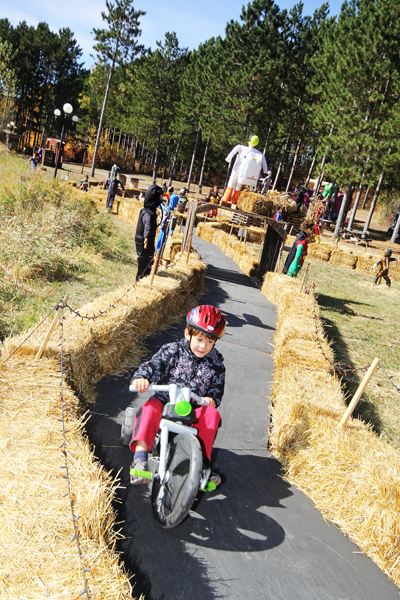 Since this is their first year in Eau Claire, Halloween Hollow is hoping for tons of community support. If you’ve been to Country Jam, you’re one step ahead of the game since Halloween Hollow is located on the Country Jam USA Whispering Pines Campgrounds (now called Road Buddies Campground) a half mile West of the Fanny Hill Inn and Dinner Theatre. This spooky fair is for everyone from college kids to families with little monsters and is open through October so get out there so we can welcome these creepy characters for Halloweens to come.